Over a century ago murderer Cyrus Gold sought to escape justice by hiding in Slaughter Swamp, where he met a fate worse than death. Mysterious forces doomed the now immortal Grundy to an endless cycle of death and rebirth. Robbed of his memories, he adopted the name of a nursery rhyme: "Solomon Grundy, Born on a Monday, Christened on Tuesday, Married on Wednesday, Took ill on Thursday, Grew worse on Friday, Died on Saturday, Buried on Sunday. 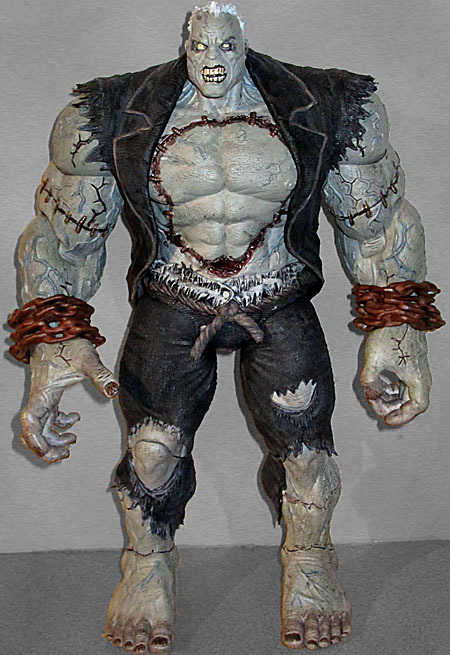 This is the end of Solomon Grundy." When we first spotted this figure at Toy Fair this year, we thought it was a two-up, the double-sized sculpt that is shrunken down to become the final figure that shows up on shelves. But nope, this monster really is the size we saw. This is the biggest Grundy ever released. Heck, it's the biggest figure DC Direct has released, period - even larger than the "New 52" Darkseid! He stands 13⅛" tall, which means he could even be a big scary threat for any 12" figures you have. 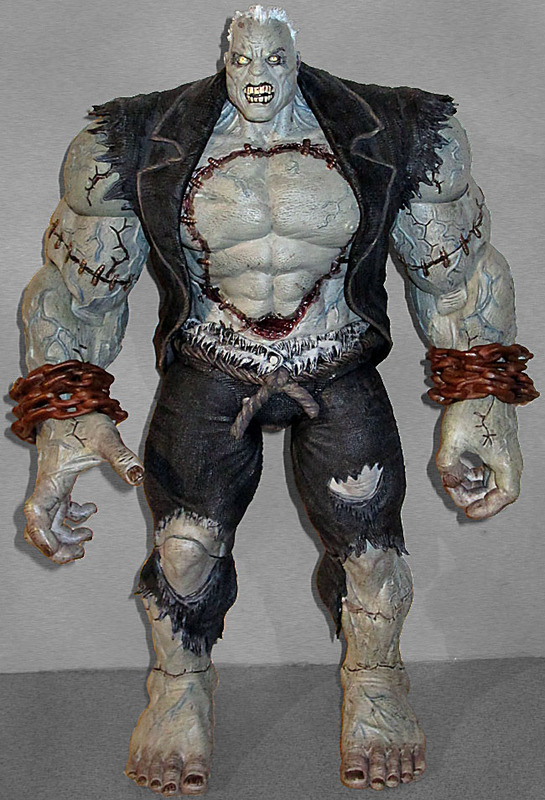 Arkham City Grundy is less "Southern zombie" and more "albino Frankenstein." He's clearly been chopped apart and stitched back togather - apparently with steel rebar, judging by the sculpt. 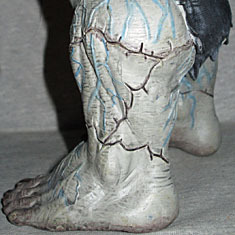 The figure was created (digitally) by Joseph Menna, and while he doesn't look exactly like the game renders, he's still fearsome. It's not like anyone is going to mistake this for a different Grundy, are they? He doesn't look anything like the standard (pre-"New 52") comicbook or Alex Ross Justice versions. As usual, a larger canvas means more room for details. 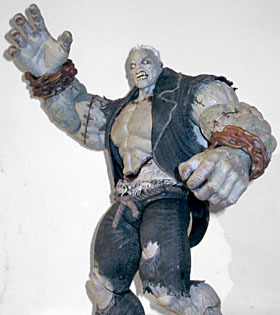 Solomon Grundy is wearing torn pants and a coat with the sleeves ripped off, and both garments have a recognizable woven texture (in addition to the frayed edges, the moth-eaten holes and the various other imperfections, of course). He has the remnants of a white dress shirt sticking up out of his trousers, And a giant piece of rope doubling as his belt. Every inch of exposed skin has a stretched texture, but the veins look like they're on top of the skin, not bulging out from underneath it. 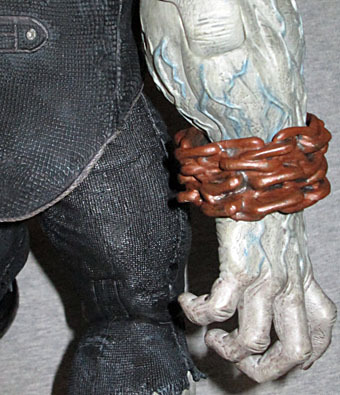 He has large, rusty chains around his wrists, but the detail on them is soft - we've seen better. The wounds on Solly's limbs don't actually look like they go all the way through - it's more like someone just cut the skin to peel it back. He's got big slashes all the way around his upper arms, and also twice around his shins (though the extra vertical cut on the legs make it look like the skin was taken off entirely, then replaced). 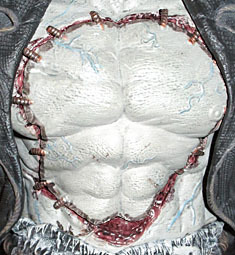 There's an irregularly shaped wound circling the front of his chest, which leads us to his action feature. 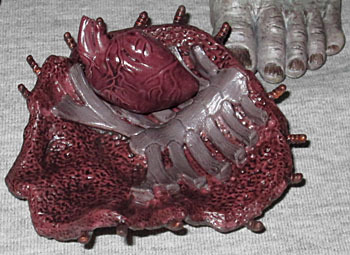 As reported at Toy Fair, the chest is removable, revealing the guts inside - ribs, lungs, heart, liver, and what we assume is the pancreas. The interior wall of the chest cap has a spongy texture and a section of ribcage. The organs all have the textures that watching CSI has led me to believe organs should have, for whatever that's worth. The heart itself can be removed for some reason, and while there aren't any pegs or whatnot to hold all the pieces together, the natural "grip" of PVC plastic means they stick in place fairly well. Grundy moves at the knees, hips, wrists, elbows, biceps, shoulders, and neck. DC Direct has had some real problems with shoulder joints breaking, especially on big monsters like this. Allegedly DCD has fixed that by using metal pegs in the shoulders, but I'm not about to try to take the arm out to see if that's true. Just know that while playing around with him, I haven't had any problems. The hips and knees don't really mean a lot without ankles, but this thing is such a massively heavy hunk of plastic that you wouldn't want to display him in extreme poses anyway. And of course there's no waist, but this time we can chalk that up to the removable chest. 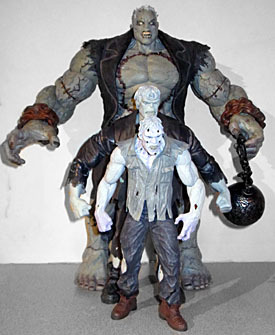 Arkham City Solomon Grundy is a very expensive toy - retail price is $90 - but thanks to the weight of the figure and poor packaging design (from a purely industrial standpoint, not artistic), you might be able to get a good deal on a "damaged box" special; my local comicshop, for instance, had a couple marked down to $45 because the plactic window on the box got damaged in shipping and they got a partial credit from Diamond. So yes, this is a big, costly purchase, but the odds of you being able to get it for a lower price are very good.